The horse's stomach is designed to take in feed all day long. It is so well designed for this purpose, that it actually doesn't adapt to receiving just 2 meals a day. Stomach acid is constantly being produced, and studies have shown that the need to eat to calm the hunger pains from that acid production occurs as early as 20 minutes after eating. This means that when you take your horse out for a ride, and 30 minutes down the road they start desperately grabbing for some grass, they aren't trying to be naughty. Your horse is simply trying to stop the discomfort in their tummy! Feed and saliva is the cure to calm the aches from their body telling them they need to eat now. Feeding once in the morning and evening means that there are hours each day and night when most horses have uncomfortably empty stomachs. 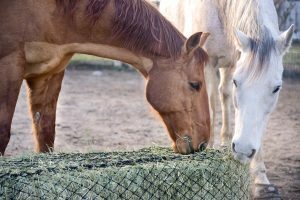 Gastric Ulcers - horses produce stomach acid constantly, intended to be buffered by feed and the resulting saliva that should be entering the stomach constantly. This acid can lead to ulcers when the stomach is left empty. Respiratory issues - due to excess dust, which is inhaled more in loose hay as they move it around to eat the tastiest pieces at the bottom. Abnormal tooth wear - since they aren't tearing their bites, or chewing as long. Increased risk of choke - due to large bites swallowed without proper chewing or enough saliva. 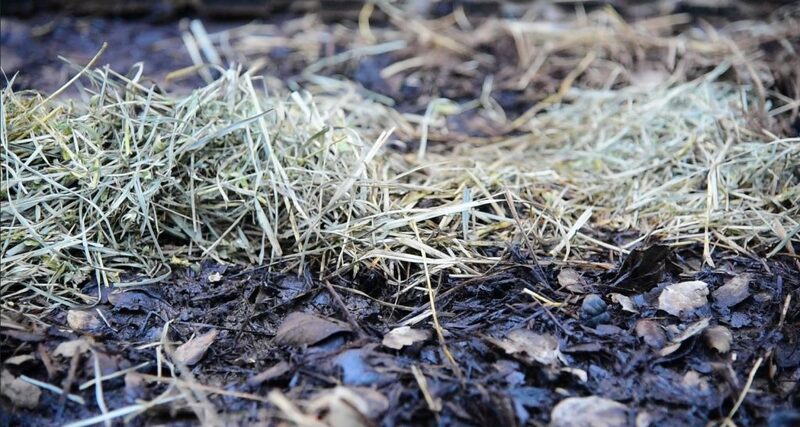 Colic - sand colic risk is increased when hay is eaten from the ground; when hay is consumed freely, the dirt that is stuck on the hay doesn't have a chance to be shaken off. Intestinal blockage risk is also increased as large bites lacking proper moisture from saliva enters the digestive tract. Boredom habits - bad habits like cribbing, chewing on things they shouldn't, destroying things, and licking or eating things that shouldn't be consumed are all in an effort to relieve hunger pains. 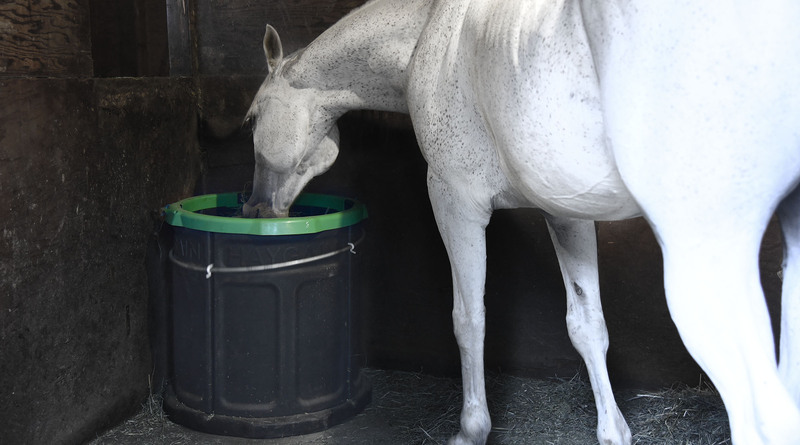 Waste - how many times does your horse urinate or defecate in their hay? Or throw it around for it to be stomped into dust or blown away? Yes, it's a lot. My horses use to be on grass pasture. The quality of their pastures varied over the years, but they always had something to graze on throughout the day. I'd never seen Tucker keep weight as well as he did while on irrigated pasture. Once he was on less than ideal pasture, however, his weight started to drop. He was fed hay in addition to the pasture, but it just wasn't enough throughout the winter. Last winter, I moved and couldn't take him right away. The pastures were next to nothing, and Tucker never recovered from the particularly cold winter without me there to blanket him at night or when it rained (he also had no shelter). Paired with the stress of an incident of choke and an abscess, then moving to a completely new area and way of life, Tucker had a rough year. Once adjusted to the new lifestyle, in dirt pens with box stalls and turnout in a dirt arena 3x a week, I thought that Tucker's weight would pick up. He was getting more hay than ever before. But he wasn't gaining, so I needed to increase his hay intake more. He's always been a very fast eater. Having just experienced the choking incident, I was worried about feeding him too much hay at once, but I could only manage two consistent feedings a day. I began looking into slow-feeders to fill this hole in their natural lifestyle, and ended up trying two different feeders. The Savvy Feeder is super portable and durable. You do have to turn it over to refill, which is a bit physically demanding. There are different grate sizes to choose from depending on your hay type, too. I like this feeder for Trubee, but Tucker flips the whole thing all over the place, usually leaving it upside down in his pee spot. He also bangs his legs on it as he flips it and kicks it, trying to get the last bits of hay. Trubee doesn't attempt this, which is surprising as he's the escape artist and mischief maker of the two of them! Their barn-mate also doesn't attempt this too much, and uses one as well. 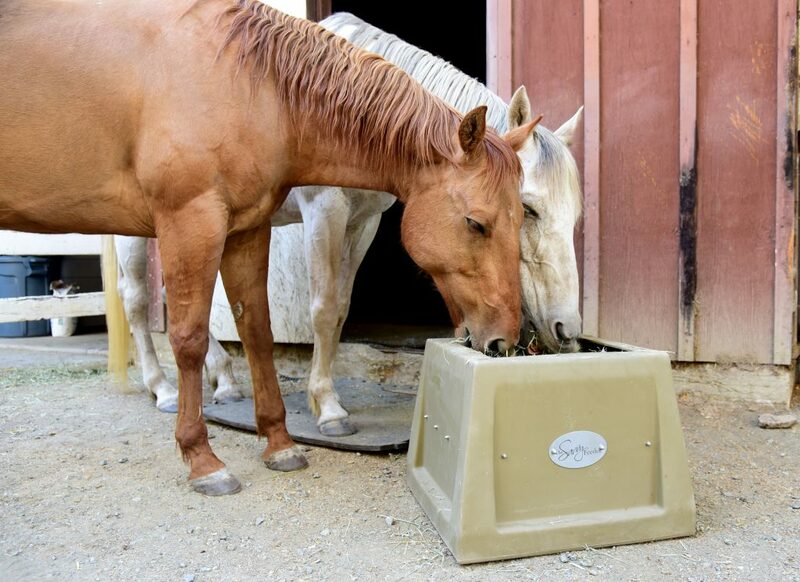 I think this feeder works great for certain horses, pastures & for travel! The Forager is weighted at the bottom, so while Tucker moved it a bit at first he quickly gave up trying to tip it. This is not a feeder you can easily grab & go, though it is easy to break down if you need to move or clean it. You remove the grate through the top, and refill with hay. It is pretty simple to use, and the tub itself is very durable. The grate might not be as durable, but they provide extras in case one breaks during the learning phase. The Forager also holds much more hay than the Savvy Feeder, enabling one feeding to last longer. I like the design of this feeder, and it works better as a stationary feeder for inside the stall. I think it would also work great in pastures, especially with the anti-tip feature! 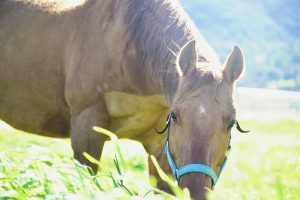 Overall, I think that any slow feeder would be a vast improvement over free feeding your horses, especially if they do not have any access to grass pasture. Feeding from the ground is an important factor, so I don't recommend nets that need to be hung. 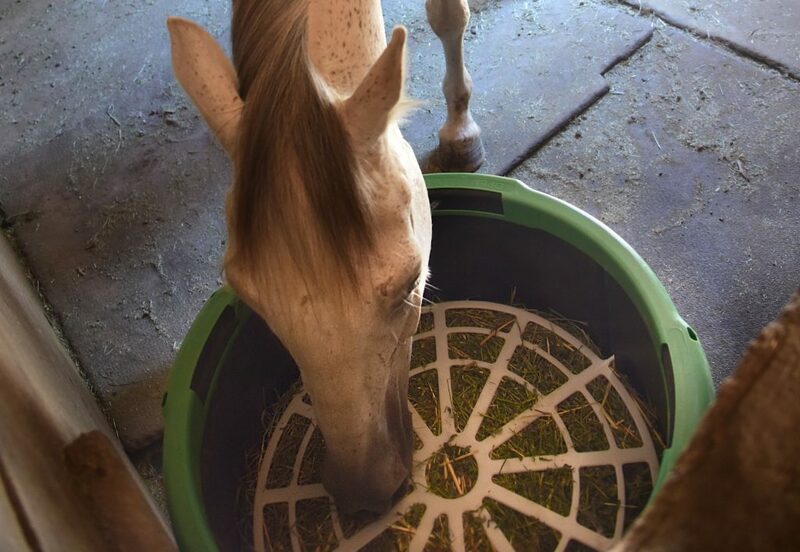 Another benefit of most slow feeders is the reduction of dirt that your horse will consume. You'll be shocked by how much dirt you find at the bottom of a slow feeder after a few feedings! This is something I didn't notice with the Savvy Feeder, since when you turn it upside down to refill it, you empty the small amount of dirt each time. With the Forager, I just had to majorly sweep it out after a few days of feeding with it. I'm happy knowing that dirt is on the ground now and not in my horse's stomach.